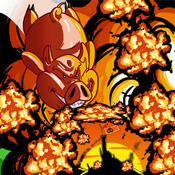 The suprise attack succeeds and the pigs are forced to live their home. But they won't let some birds just kick their butts like that. So they bought a cannon and they gone wild to fight back!